Skolkovo startup DRD Biotech has produced a working prototype of an express test that can determine in just a few minutes whether a person has had – or is at near-term risk of having – the most common kind of stroke. Svetlana Dambinova has devoted her life's work to researching the brain and strokes. Photo: Sk.ru. The test, whose prototype was developed using a grant from the Skolkovo Foundation, could revolutionise the procedure for diagnosing ischemic strokes (the most common of two kinds of strokes), and crucially, could help to predict and prevent them. Currently, suspected stroke patients undergo a brain computerized tomography (CT) scan or magnetic resonance imaging (MRI) – procedures that can only be carried out in fully equipped medical facilities – to confirm the diagnosis. The test developed by DRD will be able to be used anywhere by a healthcare provider. A drop of blood placed on the test will produce either one line or two, indicating a negative or positive result. “We’re not replacing neurologists or MRI,” says Svetlana Dambinova, who supervised the research on which the test is based. “We want to help the clinician get an objective result showing that something is going on in the brain – and where. We are simply showing who should be sent for MRI,” she says, adding that up to 25 percent of strokes are currently misdiagnosed because the symptoms exhibited by patients – such as slurred speech – can be similar to those caused by other conditions. The test is planned for use by paramedics and at military and civilian hospitals, with the aim of speeding up the diagnosis time at bedside. This is crucial for using blood clot breakdown medicines that should be given to ischemic stroke patients within hours of the event to be effective. 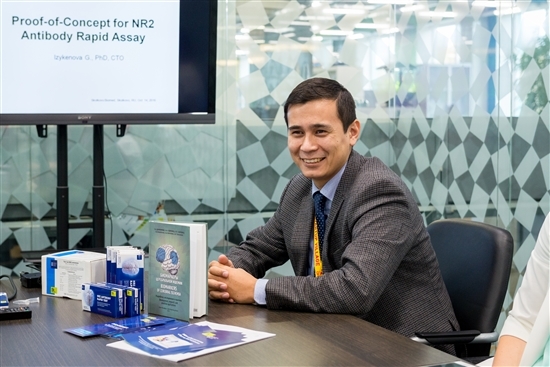 “The test is in demand among neurologists: of course before making it, we surveyed them to see what interest there was,” says Anzhey Zhimbiev, general director of DRD, a resident company of Skolkovo’s biomed cluster. DRD Biotech's prototype test, ready for use. Photo: Sk.ru. 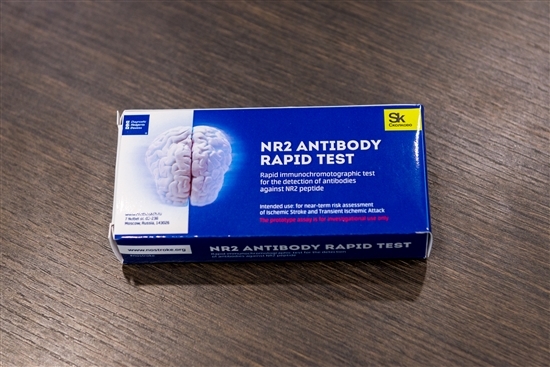 While other researchers have focused on functional biomarkers of neuronal damage, DRD’s test is based on the study of neurotoxicity biomarkers located on cerebral vessels, and works by detecting the NR2 antibody, an indicator of cerebrovascular abnormalities (problems in the blood supply to the brain). Biomarkers are indicators of specific processes in an organism. “There are a lot of neuroplasticity biomarkers, but the vascular ones that we are studying – no one else is doing that,” said Dambinova. The test assesses the near-term risk of ischemic stroke, which is caused by restricted blood flow in the brain, as opposed to hemorrhagic strokes that occur when a weakened blood vessel ruptures and spills blood into brain tissue. Ischemic strokes account for 87 percent of all stroke cases, according to the American Stroke Association. Previously, it was believed that all strokes occurred suddenly, but there are processes in ischemic strokes that begin in the brain many hours beforehand, says Dambinova. “Everyone knows that brain vessels are the first thing to deteriorate, but it can rarely be determined. Neuronal damage might be clearly revealed, but early microvessel dysfunction is less confirmed,” she explained. For Dambinova, the test is the culmination of a lifetime’s work. 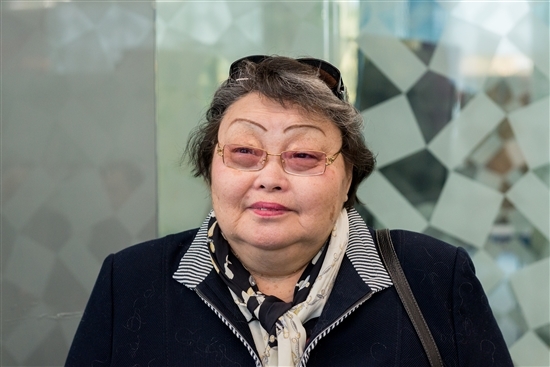 Originally from Russia’s eastern Siberian republic of Buryatia, the scientist began studying the brain in the early ’70s together with the prominent brain researcher Natalia Bekhtereva at the Institute of Experimental Medicine in Leningrad, as St. Petersburg was then known. “I’m a molecular biologist by education and a neurochemist by training, not a clinician,” she says. But it was her experience in neurochemistry that enabled her to identify and study the biomarkers of the brain vessels. Dambinova’s lifelong mission to prevent strokes is in part inspired by personal experience. Many of her relatives have suffered strokes, including both her parents, she said. That family history, plus her status as a diabetic, means she is only too aware of the risks. “The consequences are particularly terrible when a person is immobilized, when they’re bedridden, like my mother was for 12 years,” said Dambinova. “It’s a burden on the state and especially for the family, who have to spend their last money on nurses and care. I’ve been through all of that and I understand only too well all the consequences when that happens to the brain,” she said. Even more important than diagnosing ischemic strokes, then, is preventing them from occurring altogether, which could be achieved by testing high-risk patients such as elderly people with pre-existing conditions such as diabetes, hypertension and heart disease for signs of an impending stroke. “We’re trying to aid clinicians in predicting and preventing an ischemic event, rather than leaving it until it’s too late, because you can still help the brain to cope,” says Dambinova. “There are a lot of medicines [people can take to ward off a stroke] – for improving circulation etc,” she says. Anzhey Zhimbiev, general director of DRD, a resident of Skolkovo's biomed cluster. Photo: Sk.ru. This prevention could start many, many years before someone is at risk of an imminent stroke. Thirty years of research into the biomarkers have also proven a link between head injuries – even mild concussions many years earlier – and ischemic strokes, says Dambinova. “I’m trying to focus my attention and draw other people’s attention so that they look after the brain from the beginning, from early childhood,” she says. Previously, when people sustained minor head injuries while playing sport, for example, medics only looked at the damage to the neurons: no one paid attention to the brain microvessels, according to Dambinova. Her research, she says, has shown that repeat concussions can lead to strokes years later. “Lay people often think that the brain is like a bowl of spaghetti, all mixed up. That’s not the case at all,” says Dambinova. “The brain is structured and clearly divided, and each part of it is responsible for a specific function. If you receive a blow to the head in one place, your memory will suffer. In another place, you’ll lose your vision. In another, you will have a stroke, and in another place, you’ll lapse into a coma. And specific discovered biomarkers can show this. There are thousands of biochemical reactions, millions of biomarkers – and our task was to select those that match the clinical picture,” she said, adding that it has not been an easy task. Kirill Kaem, head of Skolkovo's biomed cluster, tests himself for the risk of a stroke. To everyone's relief, the result was negative. Photo: Sk.ru. In Russia, concussion is still not seen as a serious condition, according to Dambinova. But the U.S., where she is now based, is starting to understand the implications of it, as evidenced by the U.S. film “Concussion,” which was released last year. The film, based on real events, tells the story of a forensic pathologist whose research shows a link between brain degeneration and head injuries among professional football players, and his struggle with the National Football League, which refuses to accept his findings. Dambinova moved to the U.S. when faced with a choice between subsisting on a meagre Russian pension (women in Russia can retire from the age of 55) or accepting an invitation from Emory University in Atlanta, where she worked for nine years. She has since received several grants from both the U.S. military – to research concussion – and from big pharma to research strokes. Dambinova, who has jointly registered 36 patents during her career and transferred 16 of them to industry, is now based at the DeKalb Medical Center in Atlanta, and works with several U.S. universities. Earlier this month, she published an article titled “Functional, Structural and Neurotoxicity Biomarkers in Integrative Assessment of Concussions” in the prestigious Frontiers in Neurology journal, positing that neurotoxicity biomarkers could be used as part of a comprehensive approach to assessing concussions. Her co-authors included Joseph Maroon of the University of Pittsburgh, whom she describes as a leading authority on concussion. Through Maroon, Dambinova was able to work with professional football players. But if the National Football League is now open to working with specialists on the potential risks of their sport, in boxing – in which concussions are a common occupational hazard – it’s a different story, she said. Dambinova continues to work closely with specialists in Russia too, including Eugenia Alexandrova and Alexander Potapov of the Burdenko Neurosurgery Institute in Moscow, who co-authored the article in Frontiers in Neurology. She is also carrying out research in Cuba via a group of Cuban scientists who once studied for their PhDs in St. Petersburg together with Dambinova. She says international cooperation with neurologists from Germany, the U.K., Spain and Italy enables her to include the maximum volume of new research in her work. The test prototype was developed using the first part of a two-year grant totalling 97.7 million rubles ($1.5 million) from the Skolkovo Foundation that was issued to the company in May. The second, larger tranche will be released next May, and will be spent on clinical research, said Zhimbiev. “The next stage is to create a prototype test for paramedics, and we’re doing that in cooperation with the Dzhanelidze Research Institute of Emergency Medicine in St. Petersburg,” he explained. Depending on how the clinical trials go and how long it takes to steer the device through Russia’s complex legislation on registering medical devices, the test could enter the Russian market in two or three years’ time, priced at about $20 per test. In the long term, the company plans to create a more complex test that would not just diagnose a stroke, but other conditions too. “When a patient is found unconscious in the street, it could be that they have suffered a head injury, or a stroke, or a heart attack. The test will make it possible to reveal what is wrong with the patient and which centre (trauma, stroke, or cardiac) they should be hospitalized in without delay,” said Zhimbiev. That later test, which is already under development, will show different coloured lines indicating various conditions. The paramedics will be able to apply the express test and then upload a photo taken on an ordinary mobile device to a programme that interprets the results of the test, shortening the diagnosis time and enabling the patient to be taken directly to the right department of the hospital for their condition. A prototype of that programme has already been developed, said Zhimbiev. “We are working on making the algorithm more accurate, though it is already works quite well,” he said. Later, DRD plans to expand to foreign markets. “We trust that investors will be ready to believe in this project when they see the results achieved in Russia,” said Zhimbiev.